This year, part of what I am thankful for is a stove. Not just any stove, a stove with a special history. 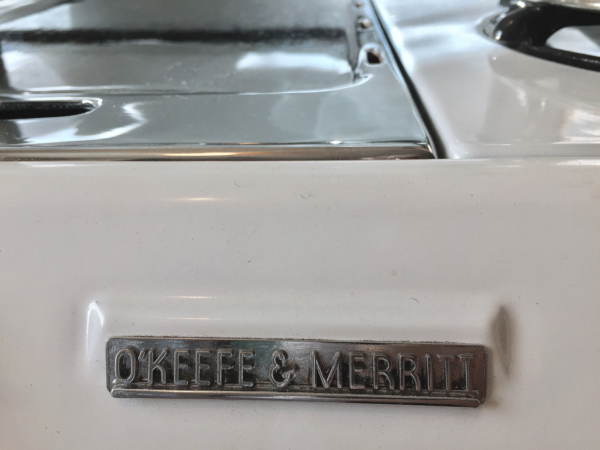 O’Keefe & Merritt nameplate on front of stove. It’s now 20 years since we moved into this house. It was rented out prior to our buying it. It needed lots of repairs, which we’ve been doing bit by bit over the years. The kitchen is largely the same as when we moved in. It originally was two small rooms, one of them a dining room. The previous owner tore the wall down and made it a bigger kitchen with French doors. Thank you previous owner, this kitchen is great. The stove that came with the house was not so great. It was an inexpensive Sears special. Over time it disintegrated due to improper venting of the heat from the pilot lights. The stove top began to split around the edges from condensation that rusted out the stove top. The final straw was when we were cleaning out the ceiling stove vent and someone stood on the stove to get the vacuum hose as far up as she could. After that I decided to look for a replacement. My dad had a Sears credit card, so whatever we got was the Sears version. It was a pale imitation of Bizzaro world where on garbage day the Bizarros gleefully receive valuable garbage. In popular culture “Bizarro World” has come to mean a situation or setting which is weirdly inverted or opposite to expectations. This was annoying. So I went to Sears to see what was up with stoves. I saw that mostly all of them had a fake chef’s stove kind of thing going on. I didn’t look too much past the electronic doo-dads festooning the stoves. First thing to break, I always say. Besides, if I wanted a chef’s stove I’d go to a restaurant supply and get a real stove. So I was inspired to look on Craigslist. I wasn’t expecting much and indeed, the results showed one listing. O’Keefe and Merritt stove, working condition. That was towards the end of the week and I made an appointment to go see it that Saturday. Stove in original owner’s kitchen. That Friday I went to Antique Stove Heaven where I learned something about O’Keefe & Merritt stoves. I was hooked. Packed into a storefront showroom were beautiful stoves all restored and shining with impeccable porcelain and gleaming chrome. I had a 1955 Chevy, a 1959 Jaguar, and other old cars and old boats that I tinkered with and kept running. These stoves reminded me of the beautiful old cars I loved. That Saturday I went to see the stove and arrived at the unmistakable scene of a home being dismantled. Some things were being discarded, everything else was for sale. The woman who owned the house was in a nursing home. Her relatives and friends were clearing the house out to prepare it for refinishing and sale. This is a thank you to the woman whose stove we now have. I can imagine that some fine meals were cooked on that stove. 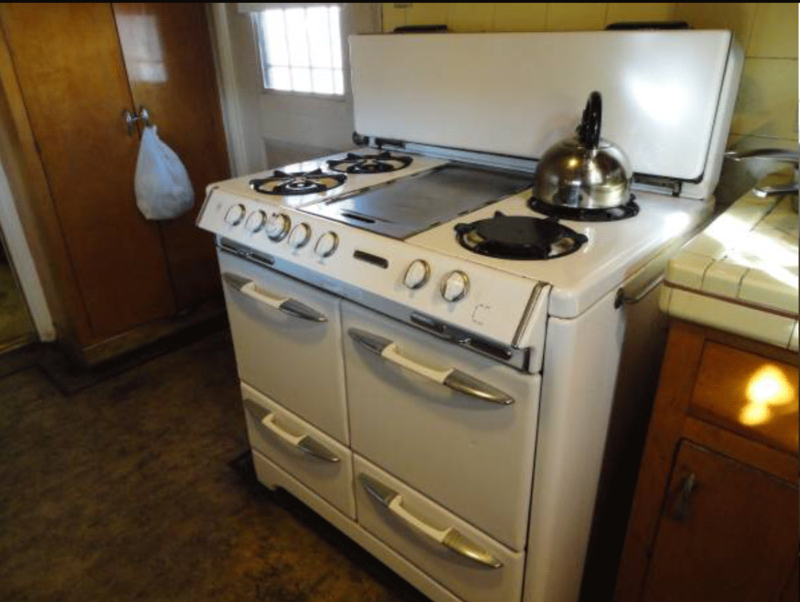 I also imagine that she bought the stove new in the early 1950s. She certainly took good care of it since it was still working after all those years. Thank you so much. Arigatou gozaimashita. 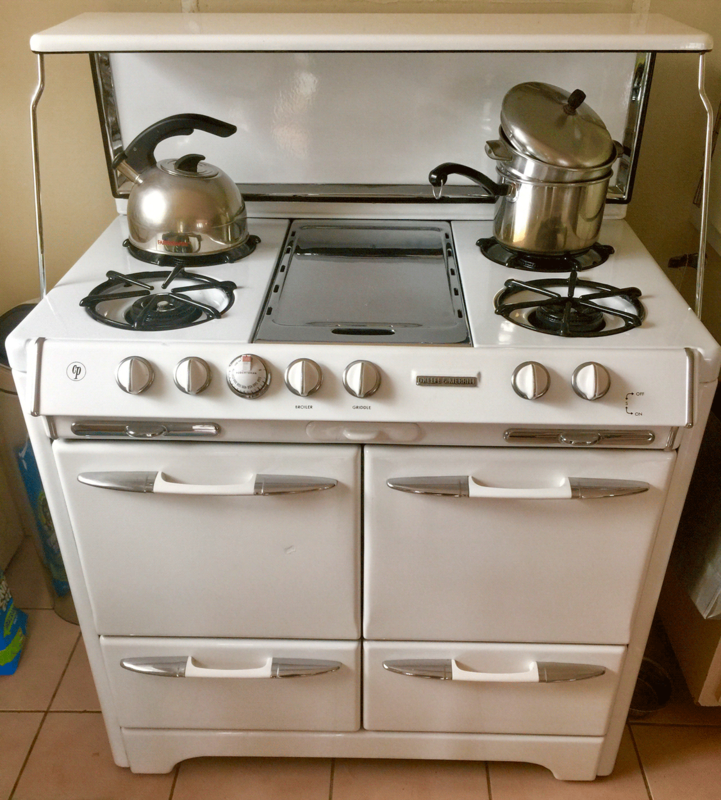 We arranged to buy the stove on 14 November 2015. We also bought a 1950’s Virtue Brothers white/gray “cracked ice” Formica & chrome extension dining table with extension leaf and 4 matching chairs in remarkable condition. 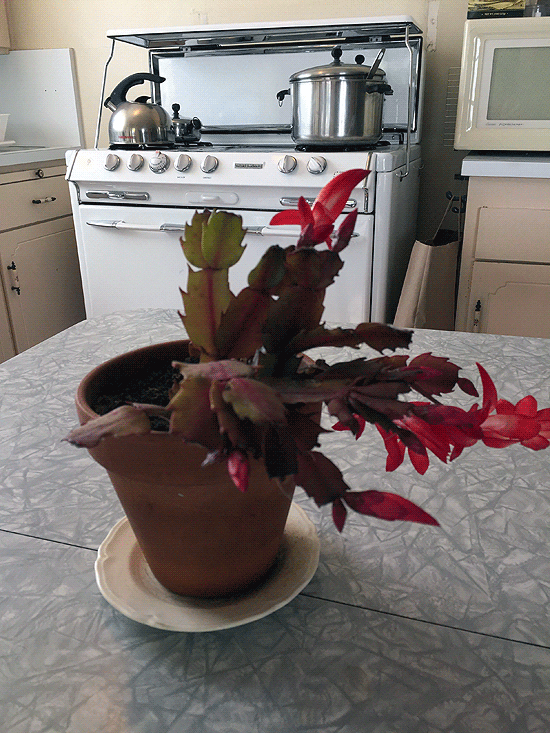 Table showing gray and white cracked ice pattern with Christmas cactus. Stove in background. 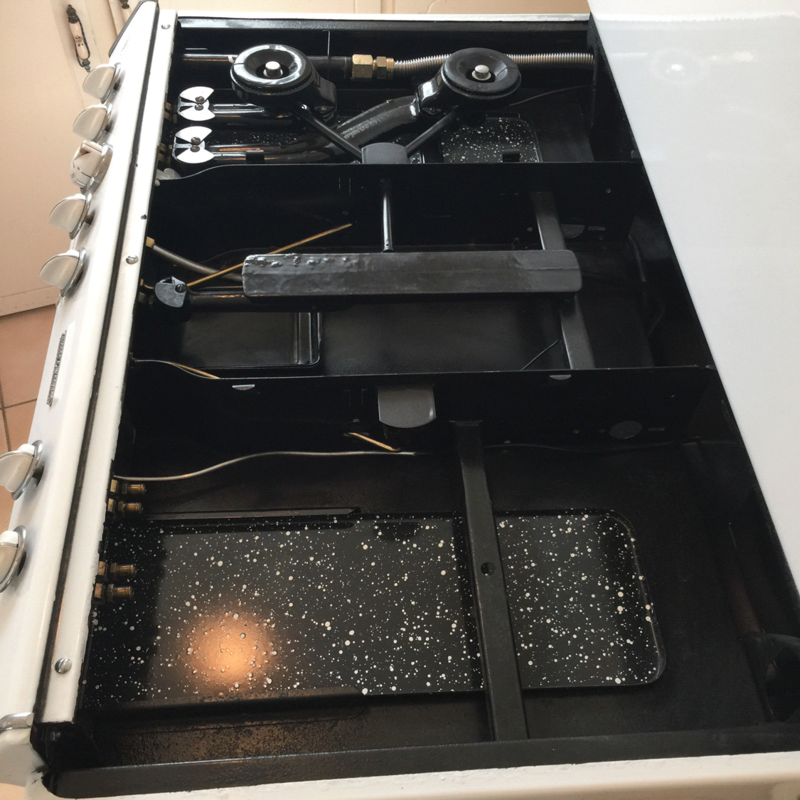 Then there was a delay picking up the stove because it didn’t have a modern gas hose with a shutoff valve, it had a straight pipe. We tried to dislodge the valve at the meter, but it was stuck tight. We had to wait until the gas was disconnected at the meter. It wasn’t until 12 December when the gas had been shut off and the stove was ready to be collected. I picked up the stove with my daughter’s good friend Juliana and her friend Lon, and put it in my backyard patio under a tarp. Shortly after that I had a stroke. It wasn’t until 6 June 2016 when I was able to focus on the stove. It was slightly worse for the wear being out in the weather, but nothing a good scrubbing and some elbow grease wouldn’t cure. Or maybe not. 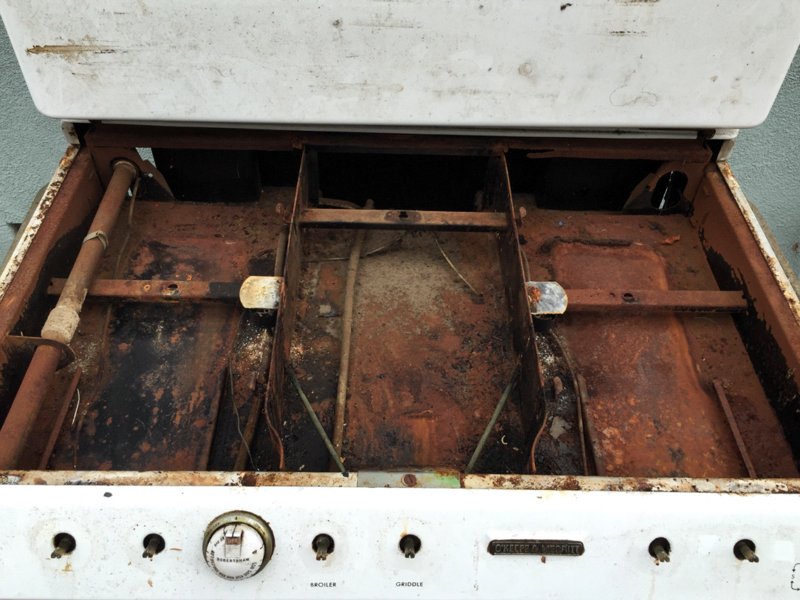 Stove top off, burners disassembled, drip trays removed revealing lots of rust. Meanwhile I read everything I could about O’Keefe and Merritt stoves and after reading a website detailing an amateur rebuilding one of these stoves I concluded that my usual bumbling about while fixing things mode would not do. Risking gas leaks and possible explosions was not in the cards. Aside from the risk factor there were parts that needed refinishing, might as well get it taken care of professionally. Antique Stove Heaven came to my house, gave the stove the once-over, and noted the problems. They came again to take it to Heaven and eventually returned it completely and beautifully restored. After that they came out to correct an issue with one of the burners. Great service! Under the stove top repainted, burners re-porcelained, being reassembled. I have to thank Antique Stove Heaven for making this O’Keefe & Merritt stove a beautifully restored part of our family. I imagine that we will be cooking many fine meals on it, just like I imagine the original owner did. Thank you O’Keefe & Merritt, thank you Juliana and Lon, and thank you very much to the woman who owned the stove and kept such good care of it. Thanks! Beautifully restored 1950s O’Keefe & Merritt stove installed in our kitchen. 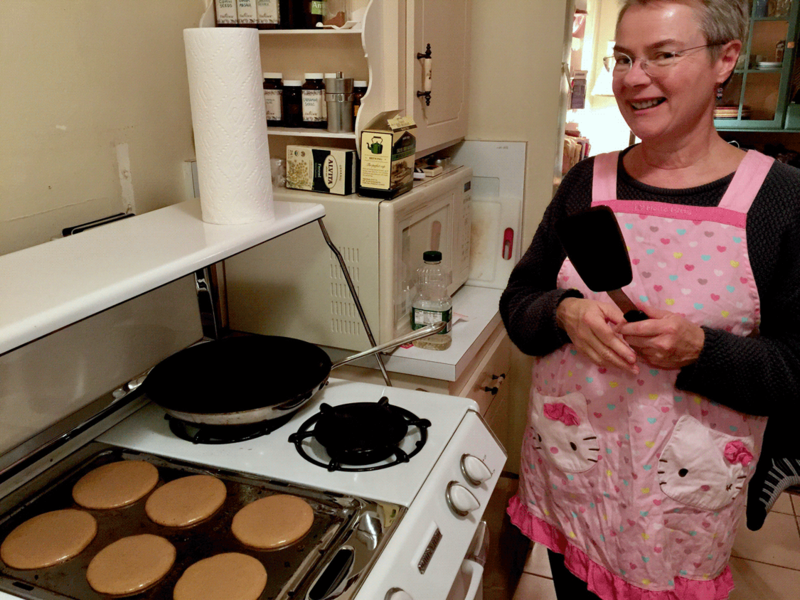 Linda making some gingerbread pancakes on the griddle. My mom, Lucy, was born in Tullamore, Co. Offaly, Ireland in 1921 and lived in a small house right next to a church. One wall of her house made up one of the walls of the churchyard. She had a brother, Jack, who was hit by a car when he was young, after which he was in a coma for months. What they said about Jack was that “he was not right” after that. Lucy’s dad was a baker, and her mom was somewhat of an invalid. She had what they called a milk leg. This, it turns out, is lymphedema, and it runs in the family. I have the condition in my left leg, as does one of my cousins. When she was eight years old, Lucy’s dad died, and her mom died when she was twelve. This left her to care for Jack and herself, so she went to work in a sausage factory. Her mom’s four sisters had all emigrated to New York and eventually they sent Lucy passage on a converted Liberty ship and she left Ireland in the late 40s. Later, when she had saved up enough, she sent for Jack. He described something he witnessed on that Liberty ship: “There was a storm, and you could see the two ends of the ship rising up and the middle bowing down.” It’s a wonder they lived through it all. My dad, Joe, was born in 1917 in the kitchen of the family farm in Ballyheigue, Co. Kerry, Ireland. His mom, Mary Ann, emigrated to New York sometime after he was born, leaving him to the care of the family. He grew up wild, and would do anything to have a bit of fun. He told me about being very young and hiding in the thatched roof of a house where there was a wake in progress. He and his friend Mikey spit down on the people inside and eventually one of the women below remarked “wid a wah, it musht be raining” in a slow Kerry drawl. He talked slowly all his life, though he eventually did acquire a mild New Jersey accent later on. He fished, and helped with the farm work, and tended lobster pots and had many stories to tell about dangerous adventures at sea in a currach, which is a wood-framed tar-paper-covered canoe they made themselves. I’ve seen the waves on the wild Atlantic coast where he was raised and it’s a wonder that they lived to tell the tale. He also attended a one-room schoolhouse where the fee was a lump of coal a day or maybe some spuds. We have stayed in the Old School which has been restored beautifully on our visits to Ballyheigue and I highly recommend it. He did not come into the farm, and figuring that he’d try his hand at making some money, he went off with a friend to Dublin, then worked the sugar beets in England, and finally emigrated in the late 40s to New Jersey where his mom lived. At the time they arrived in the New York area, though the Irish made up a sizable portion of the population, Dad told me that when he went looking for work, there were many factories with signs that said NINA, or no Irish need apply. It also meant no Italians need apply. He did find work though and he was never without it again. He had an iron willed work ethic and seeing my somewhat less enthusiastic approach to work he said of me: “he loves his job so much he’d lay down beside it.” Nonetheless, I was also a hard worker even though he called me a “narraback” or narrow back from a lack of hard labor like cutting turf or tending lobster pots. My dad was interested in dancing and sports and meeting up with the new friends he made. Weekends saw him up in The Bronx at what they called Croke Park which was actually Gaelic Park. There, at a dance, he met Lucy. They eventually married, settled in Bergen County, New Jersey and had two children, me and my sister Una, who still lives there. Joe and Lucy are gone many years now. I’ve tried to live up to their expectations and think I have. My heart aches at missing them, but this is the way of the world. We don’t get to stay forever.